Looking for a way to re-engage past customers and prospects on Facebook? Wondering how to use remarketing to deliver behavior-based messaging to specific audiences? If you’re looking to build successful remarketing funnels on Facebook, you’ll need to deliver unique ads to custom audiences segmented according to their browsing history and interests. In this article, you’ll discover six ways to turn past website visitors and cold leads into loyal customers via Facebook remarketing campaigns. 6 Facebook Remarketing Tactics That Work by Karola Karlson on Social Media Examiner. Once people have visited one of your landing pages, you know two things: they’re interested in a particular product or feature and they’re already familiar with your business. Targeting this warm audience with a generic offer would be a waste of time. Instead, create landing page-specific Facebook ads that are highly relevant to your audience. For example, this remarketing campaign from SaaS startup Scoro targeted a custom audience of visitors to a project-related landing page in the last 60 days. Set up a Facebook custom audience of visitors to a specific landing page. All of the ads in the remarketing campaign focused on project management, making them highly relevant to this audience. Run a Facebook ad that’s highly relevant to your custom audience of landing page visitors. While the audience was fairly small (about 2,000 people), it generated 12 leads in the first 20 days at a 70% click-to-conversion rate. Not bad for a Facebook ad campaign! This Facebook ad generated 12 leads in the first 20 days. To target website visitors, you need to create a Facebook custom audience. First, install the Facebook pixel if you haven’t already done so. Then go to the Audience section of Facebook Ads Manager. Click Create Audience and select Custom Audience from the drop-down menu. Next, select Website Traffic to create your custom audience. Select Website Traffic to set up a Facebook custom audience of website visitors. From the Website Traffic drop-down menu, select the option to include people who have visited specific web pages. Then type in your landing page URLs. To create your Facebook custom audience, select People Who Visit Specific Web Pages and type in your landing page URLs. With these current settings, you’ll also be targeting the people who visited your landing page and already made a purchase. To eliminate purchasers from your custom audience, add another condition to exclude visitors to your thank-you page. After you add a name for your audience, click Create Audience. When setting up your custom audience of website visitors, exclude people who have already made a purchase. Keep your offers landing-page specific. Be clear about the next step (e.g., use the Sign Up or Shop Now call to action). Rotate your ad designs and offers to see what works best. Add a small discount to nudge people to revisit your website. Don’t forget to exclude people who already converted. Blog visitors find your site via search engines, paid promotions, email newsletters, referrals, and many more channels. For most blog readers, the first visit will also be the last; they’ll soon forget about your blog and move on to read the next one. Remarketing to these readers is a great way to recapture their attention, eventually turning them into returning readers. One of the best ways to warm up cold leads is to share free high-quality content. For instance, use Facebook boosted posts to reach more readers with your blog articles. Boost Facebook posts to drive more traffic to your blog. Or step up your game and offer a free ebook or giveaway. Offer a free ebook or giveaway to remarket to blog visitors. If your blog covers several topics, you can segment your Facebook custom audiences by topic to ensure your ads reach a highly relevant audience. To retarget blog readers, create a custom audience of people who have visited your blog’s home page or read specific articles. Create a Facebook custom audience of visitors to your blog’s home page. Start with soft sells to increase brand awareness. Don’t ask people to buy something right away. Make sure your ads are relevant to a specific article’s readers. Use Facebook boosted posts to amplify your blog’s reach. Exclude people who have already read/downloaded your promoted content. Trying to get people to buy more might seem counterintuitive. However, according to Monetate research, almost half of overall revenue from U.S. online retailers comes from repeat customers. There’s a potential gold mine waiting to be uncovered. Get creative and think about possible upselling opportunities for new Facebook remarketing campaigns. For example, Target could retarget people who purchased baby food with additional offers on children’s products. Retarget past purchasers with offers for similar products. Or if people previously bought black tea, Teabox could retarget customers with a discount offer a few months after their initial purchase. Retarget past purchases with discounts a few months after their initial purchase. The easiest way to create a custom audience of past converters is to target your thank-you page URL. When selling multiple products, you can also set up custom conversion events for advanced audience targeting. To create a Facebook custom audience of past purchasers, add your thank-you page URL. Get creative with upselling campaigns. Promote related or complementary products. Offer a discounted price for buying more. Remarket a few weeks after the initial purchase. Run limited-time offers that create a sense of urgency. If you’re in the software business, there’s a good chance that many of your leads aren’t paying users. The good thing about freemium users is that they’re already familiar with your product and if offered a valuable update, they may be willing to start paying for your product. Promote the benefits of your product when remarketing to freemium and free trial users. To prompt freemium users to become paying customers, you can also offer a discount on the initial purchase. 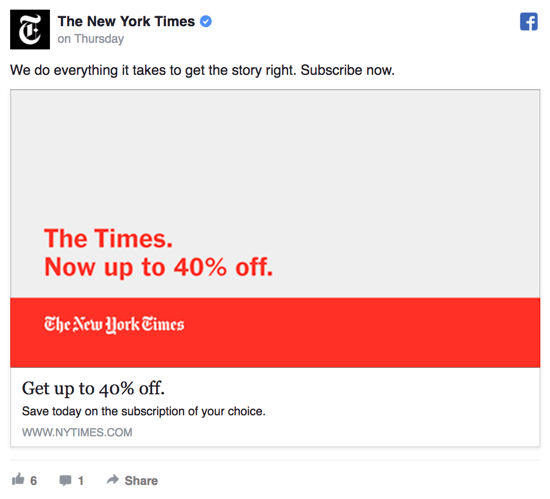 The New York Times, for instance, gives first-time subscribers a 40% discount, encouraging people to sign up. The most accurate way to retarget freemium users is to set up a custom conversion that signifies a freemium account’s signup. Next, create new Facebook custom audiences of people who have just set up a free trial account or a freemium account. Offer freemium users a discount on their initial purchase. Offer a significant product update that people are willing to pay for. Share case studies and overcome possible objections. Promote guides for getting started. Exclude people who have set up a payment profile. There are two types of newsletter subscribers: People who almost always open and read your emails, and people who never open an email from you. MailChimp’s analysis of 60 million ecommerce purchases and 40 million email addresses from retailers showed that one inactive subscriber is worth 32% of an active subscriber. To remarket to newsletter subscribers, start by segmenting your email lists into those two audience groups. Focus first on the active readers who are highly engaged. You can target this audience with more sales-oriented offers such as Sign Up, Get Started Today, or Shop Now. To remarket to engaged newsletter subscribers, use sales-oriented offers, such as Shop Now. But what about the disengaged newsletter readers? Use Facebook remarketing to turn inactive subscribers into your biggest fans. Start with a soft sell by sharing an insightful blog article or a free ebook to remind people of your business, just like the ad below does. To remarket to disengaged newsletter subscribers, share relevant blog articles. To create a remarketing audience of your newsletter subscribers, create a new custom audience and select Customer File. Select Customer File to create your Facebook custom audience of newsletter subscribers. Next, choose whether you want to add a customer file or import contacts from MailChimp. Decide whether to upload a customer file or import email addresses from MailChimp. If you want to upload your customer file, export it from your email marketing software and import it to Facebook as a .txt or .csv file. Upload a .csv or .txt customer file to create your Facebook custom audience. Segment your audience into active and inactive readers. Create different ads and offers, depending on the user’s engagement level. Share relevant educational content (e.g., blog articles and ebooks). Create further segments to deliver more relevant ads. We’ve all been there. You add multiple products to an online store’s shopping cart, but then decide you don’t really need them. To get shopping cart abandoners to return to your site and complete their purchase, create a new Facebook custom audience and set up a remarketing campaign. You could use emotional triggers such as a limited-time discount offer. Udacity uses this tactic in the Facebook ad below. Offer a discount to people who almost completed their purchase. Another way to get people to return to your site is to remind visitors about specific products they missed. For example, if someone added coffee beans to their shopping cart, remind them of that exact product in your remarketing campaign. To set up a remarketing audience of people who added products to their shopping cart but left their purchase unfinished, include your check-out page’s URL and exclude your thank-you page’s URL. Include your check-out page URL and exclude your thank-you page URL. You can also set up more detailed remarketing audiences by using custom conversions. Remarket the exact product people left unbought. Offer a discount to convince people to complete their purchase. Make limited-time offers to create a sense of urgency. Start remarketing right after people leave their shopping cart. Marketers spend thousands or even hundreds of thousands of dollars to get people to their websites, but only a tiny fraction of those people decide to make a purchase on their first visit. With Facebook custom audiences, you can retarget every one of your website visitors with a highly relevant offer. If you’re looking to build successful remarketing funnels and get high campaign ROI, a single remarketing campaign won’t cut it. You’ll get the best results when you segment audiences according to their browsing history and interests. These six Facebook remarketing tactics will help you turn past website visitors and cold leads into loyal customers. What do you think? What are your go-to Facebook audiences? Leave a note in the comments!